又是一個 Physical / Virtual World 融合的例子. MIT 的 Quickies 計畫把 Post-it 數位化, 主要利用 RFID, AI, OCR 辨識, Context-Awareness & Knowledge Reasoning 等等技術. 在特殊的撰寫紙條 ( Sticky Notes ) 上裝有 RFID, 因此可以進行追蹤管理, 同時利用 Digital Pen 在撰寫紙條寫字, 可以自動把內容擷取到 PC 上, 透過 OCR 進行內容辨認, 最後利用 Knowledge Reasoning 以及 AI 決定 PC 會相對應自動採取哪些動作. 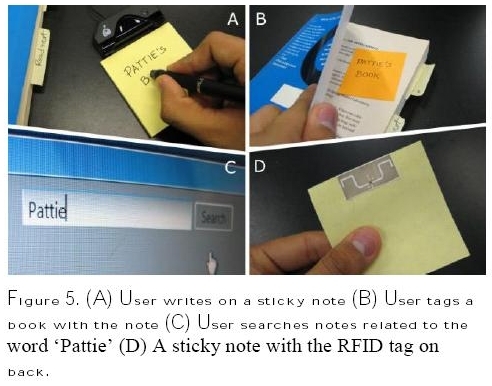 The project explores how the use of RFID, Artificial Intelligence and ink recognition technologies can make it possible to create intelligent sticky notes that can be searched, located, can send reminders and messages, and more broadly, can help us to seamlessly connect our physical and digital worlds. 個人認為重點在於最後的一句話. 從這句可以看出 Quickies 的 Power 在於自動把現實生活中的物件, "拷貝" 進 PC 的虛擬世界中的能力. 其實在過程中用到的技術都已經是被開發出來的, 並沒有甚麼十分創新的技術在裡面, 但是整合起來的結果卻是一項十分便利的準科技產品. 同時 User Interface 也很漂亮, 我之前用過的 Post-it Software 都很醜, 不管是 Windows 上或是 Linux 上得, 光是這個 User Interface 其實就足以獨立變成一個很吸引人的 Desktop Software 了. 其實我覺得除了 Post-it 本身的使用方式, 以及利用 RFID 對物品作追蹤管理之外, MIT 的 Quickies 還有一個可能十分強大的應用 : 作為 Smart Home 的命令輸入器. 過去 Smart Home 的命令輸入還是以遙控器類型的為主, 語音辨識會有口語差異大, 各語言辨識轉譯, 以及因為生病等因素導致腔調改變的問題. 而 MIT Quickies 其實可以作為一個短期內 ( 可能是四五年左右 ) 可以接受的過渡性產品. 大部分語言的手寫辨識其實已經有一定的辨識完成度, 因此技術挑戰比語音辨識來的小. 只要會寫字, 甚至會畫圖, 就可以控制 Smart Home 了. We thank Professor Hiroshi Ishii and Professor Henry Lieberman for their valuable feedback and comments. We would also like to thank Dawsen Hwang of NTU and the fellow MIT Media Lab members who have contributed ideas and time to this research. 很用力的透過 Google 查了一下, 應該是台大電機 108 級 ( 還是 109 級? ) 的黃道生 ( Dawsen Hwang ), 不過不知道怎樣跟 MIT 搭上關係, 可能是交換學生, 或是畢業後到 MIT 繼續攻讀學位了吧. 不管怎樣從 Google 到的資料可以看出也是強者一名就是了. This entry was posted on 下午5:48 and is filed under context-aware , data and knowledge engineering , Embedded System . You can follow any responses to this entry through the RSS 2.0 feed. You can leave a response, or trackback from your own site.